OPGC (ITPS) has been selected for the prestigious "Greentech Environment Excellence Gold Award in Thermal Power Sector for the year 2004-2005". OPGC (ITPS) has been selected by Greentech Foundation for the prestigious "Greentech Environment Excellence Gold Award in Thermal Power Sector for the year 2004-2005". 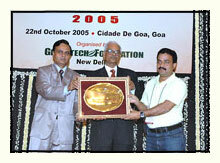 OPGC received the award on 22/10/2005.